Discussion in 'Standup Technique' started by Retry, Aug 6, 2015. I've seen it done a few times and always thought it was pretty cool. How exactly is it done? Does it have a specific name? It seems kind of useful to set other things up. Can you guys please share? I think this belongs in the grappling section. Looks like Nick wrapped his neckd and arm around silva's hand. If I had to make up a name I'd call it the "Counter-Overhand One-handed Kimura 209" lock. Or just the "cook 209" for short. was that coming off a strike or were they breaking a clinch? you see it in the MT clinch...don't know the name for it though. Anderson has a basic collar tie on Nick. Nick throws a punch over the top to counter. Very basic move. No special name. I was pretty surprised no Ben Saunders threads showed up on the striking forum lately. His fight was like a "best of MT" clinic in my eyes. Everyone thinks leg kicks define MT but its the standing grappling that is far and away the best asset IMO. that might be whats going on in that pic but theres a technique in the MT clinch when someone has a double or single collar tie on you and you bring your arm over theirs (like in the pic) and trap one of their hands/wrists between your shoulder and neck. its uncomfortable and can get them to release the clinch. cant really describe it better and im not going to dig through clinch vids to find it right now. maybe someone else can explain better. I think you are right. The same thing happened in the Anderson silva vs griffith fight. Round 1 at 2:40 mark. Silva throws left hook. Forest Ducks. Silva clinches only with left arm and throws a knee? Grifith throws a right hook over the tie and I think it catches silva across the face, but he ends up tangled really oddly for a second or two in the same way nick diaz looks in this picture. 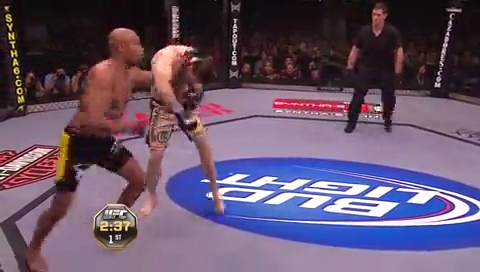 Silva counters with an upper cut with his opposite hand at forest. I kept thinking the 'tangled' look was some sort of special manuever by silva, but it appears that it is just silva with a collar tie then the other person throwing a hook and ending up looking odd and kind of tangled with silva still holding the collar tie. I'm not sure if in the nick diaz fight Silva also ate the punch since I don't have it . Ask Dan the wolf man, he invented it. yes, something very similar to that, except Kem would have to bring his left arm over and down to his right on the other side of his opponent. you almost have no choice but to release the collar tie. almost like a standing armbar of sorts, since there's intense pressure on the arm if he doesn't let go of the back of your head. Probably more common than it should be- throwing a punch over the top of control like that, it'll almost never hit (effectively) due to the cover that having that single collar will provide. He didn't invent it. He just showed it to Anderson... and he showed Nick the counter. He didn't show it to Anderson per se, but he did show it to the guy who details anderson's brothers cleaning ladies car. Coincidence that silva uses it in his next fight? I think not. Bit like this ude gatame except that you just trap it with your neck?